Part of the string of forts established in 1848 to protect westward settlers, the fort was named after Lt. George Mason, who had died at Fort Brown during the Mexican War. Another source says that it was perhaps named after a popular General (Richard Barnes Mason) who died just months before the fort was built. 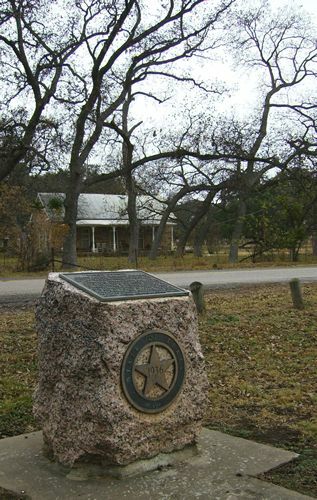 Established prior to the organization of Mason County, the fort was included inside the boundaries of what was then Gillespie County. From the early 1850 until the early 1860s, Fort Mason’s presence kept Kiowas, Lipan Apaches, and Comanches away from the encroaching settlers. Although the fort was abandoned for two brief periods, it reached its maximum consignment of troops in 1856 while under the command of Colonel Albert Sidney Johnston. In March, 1861, the fort became Confederate property. In time, twenty junior and field grade officers stationed at Fort Mason became generals in the Civil War. 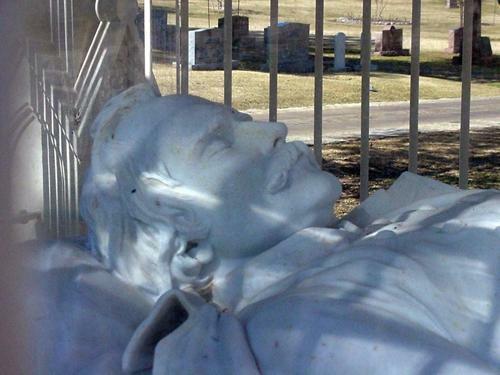 Confederates generals included Hood, Lee and six others. Twelve of the twenty became Union general staff. The Confederate Army held 215 men prisoner at Fort Mason in 1862 under suspicion of being Union sympathizers. During and after the war, Indian attacks grew more frequent. In late 1866 the fort was re-occupied, repaired and refurbished. Lawlessness during Reconstruction reached the distant post and instead of bringing order, the post was affected in a most un-military way. Courts-martial were common and desertion was rampant. Cavalry was replaced with Infantry and the post’s last official inspection was January 1869 when it had a skeleton detachment of less than 70 personnel. By the end of March the fort was officially closed. 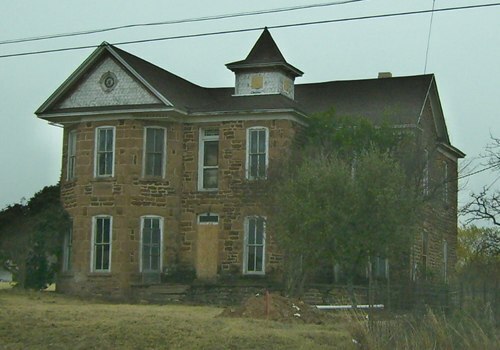 It reopened briefly in 1870 but closed forever in 1871. The native stone buildings, which once numbered 25 were spirited away (stone by stone) to reappear in town, transformed into residences. In the mid 1970s the pattern was reversed when local citizens rebuilt a former officer’s quarters from the well-used rock. Created January 22, 1858, and organized August 2, 1858, this cunty was named for its most important settlement, Fort Mason. Garrisoned intermittently from July 6, 1851 to March 23, 1869, Fort Mason was named for Lt. G.T. 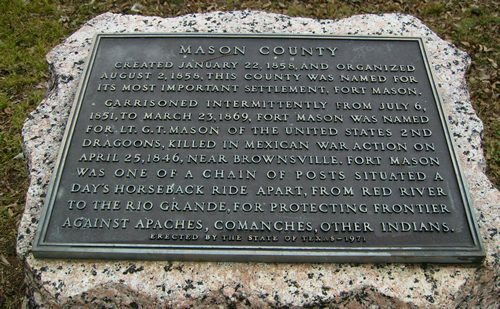 Mason of the united Stated 2nd Dragoons, killed in Mexican war action on April 25, 1846, near Brownsville. Fort Mason was one of a chain of posts situated a day's horseback ride apart. From Red River to the Rio Grande, for protecting frontier against Apaches, Comanches, other Indians.